Welcome, oh weary internet traveler, to a site unlike any other in the infinite immensity of cyberspace!! Here you will find much to read, reflect upon and rejoice over. 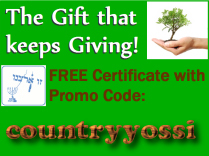 If you seek to peruse the latest issue of Country Yossi Family Magazine your quest will be successful and your fondest wishes amply rewarded! For not only will you find the latest outstanding articles, insightful columnists and our trademark humorous pieces in abundance here, but previous issues as well. If perchance you’ve never heard of “New York’s Premier Jewish Magazine” then we welcome you to our universe and hope your stay is a pleasant one (though how you’ve survived lo these many decades is beyond our comprehension)! Celebrating 20 years of publishing excellence and having distributed freely and without malice close to 3 million copies in the greater Metropolitan area, and dotting the landscape across the fruited plain, we graciously present you with the crème de la crème of our efforts thus far. But that’s not all, chosen one!